He will love them, I'm sure of it! After spending a little while with someone, you get an idea of what things they love to eat, and learn which foods elicit a less than enthusiastic response (or a huge clean-up effort if said-person is a toddler). My kid loves to cook with anybody that will let him. He knows his way around the kitchen all too well, for someone who is one and a half years old, and is far more involved than any parenting guide would recommend. So I thought, I know, I’ll set some pizza dough to rise and when we get back home, he can punch it down and help me roll it out to make calzones together. We’ll fill them with ingredients that he loves and he’ll devour it. I’ll know exactly what goes into the pizza dough so I won’t be wondering what additives he’s consuming. This particular dough had a hint of honey instead of white sugar, and I substituted some of the wheat flour for spelt flour. It will be great. A tactile, educational, fun and nutritious experience. The real story unfolded in quite a different manner. He did find poking the dough and watching it recoil rather amusing. But that’s where the interest stopped and the whinging started. 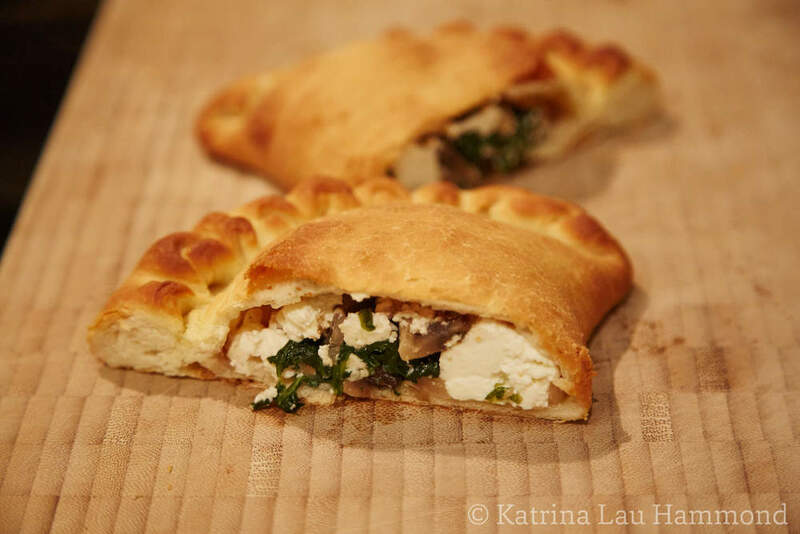 Nevertheless, I made the filling with him – firm ricotta, wilted baby spinach, sautéed mushrooms, and caramelised red onion – and kept attempting to peak his interest and involve him in the process. He shot a glance my way when I pulled out my big long French rolling pin (the ones that have no handles) to roll out the dough. With him rolling around on the floor (not with laughter), or clinging to my leg (not in eager anticipation), I battled on to get dinner on the table. I filled the calzones, folded them over and pleated their edges. He then rejoined the cooking team when it was time to brush them with egg wash. By this time my husband had thankfully arrived home to help distract our cranky child. We oohed and ahhed when they came out of the oven. We let out big oh wows when we cut them open to let the steam out and reveal the tantalising fillings. We sat down around the table together, everybody with a plate full of homemade calzones. Outright refusal. Did not want a bar of it. Cried and screamed and threw things until we let him out of his booster chair. About half an hour later he decided that he was hungry. For dinner that night he chose reheated plain white rice. With an appetiser of dried sultanas. He sat by himself at the dinner table, practically swallowed up by an adult dining chair, with his chin barely poking over the table. Three or four mouthfuls later, he was full.